Audubon offers a fun alternative to the same old Easter Egg Hunt! 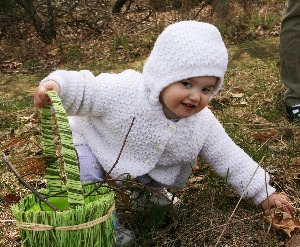 Children, ages 3 to 10, hunt for brown eggs in a natural setting and quickly learn how well the eggs camouflage. Prizes are awarded to all children, with grand prizes given to the finders of the “golden eggs.” Please bring a basket. Check-in will begin at 9:30 am. The Egg Hunt will start promptly at 10:00 am and is held rain or shine. Advance registration is required. Help cheer on the little ones as they discover how well the eggs camouflage in nature. Other tasks may include setting up prior to the event, helping hide eggs, supervising and leading the kids to the search areas, and/or overseeing the craft area (including participants and materials in a room with many families at once - crafts will be held at Smithfield and Bristol locations only). Volunteer shift is from 8:30 am - 12 pm. Positions available in Smithfield, Bristol and Seekonk only. When registering, choose "Events", then "Egg Hunt" and pick your location!